Franken-duck Appears In New Show! I love taking old props and old ideas and doing something different with them. This little guy is commonly known as The Card Duck. It’s been around in this form since the 1930s. Earlier versions were more elaborate and some actually looked like real animals. I think the wooden duck version was likely inspired by the Lego company’s Wooden Toy Duck which debuted in 1935. 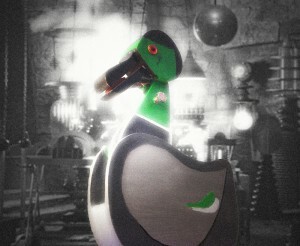 I have customized a number of these ducks and the latest version is FrankenDuck! He has the bolts in his neck just like ole Frankenstein, and I give him a very Dr. Frankenstein style introduction. Like all other Card Ducks he locates chosen cards, in this case, chosen Alphabet Cards. Though I must admit I think my version is much more amazing because I have an audience member shuffle the cards before FrankenDuck does his magic. You’ll get to see him in the Fall-O-Ween Magic Show and possibly in the Very Spooktacular Magic Show in October! October 17, 2015 in Blog. ← 3 Fall Shows, Lots of New Stuff!